IBPS PO 2018 – Find the details of IBPS PO 2018 Notification, Syllabus, Apply online link and more here. IBPS PO 2018 has announced notification with 4102 Job vacancies. The link IBPS PO apply online for IBPS PO 2018 will be activated from 14th Aug 2018 to 04th Sep 2018 The exam of IBPS PO 2018 will be conducted at various locations across India. The applicant can select the exam city as per their preference from the IBPS PO 2018 online application list. Apply in advance for IBPS PO online application. Other eligibility details, exam date, and other information are following below. Institute of Banking Personnel Selection organizing the exam for Probationary Officer post. IBPS is a gateway to recruiting various banking jobs. IBPS has announced recruitment notification to enroll various candidate to all Public-Sector Banks. Applicants of IBPS PO 2018 are requested to apply online. From the year 2011 IBPS has introduced a Common Written Examination (CWE) to recruit Clerk, PO and SO jobs. Qualified candidates are invited to register IBPS PO online application from 14th Aug 2018 to 04th Sep 2018. The IBPS PO Apply online link will be available on an official webpage at ibps.in. The selection of IBPS PO will under for 3-tiered selection process. The phase of selection will be through Preliminary and Main Exams followed by Interview. Qualified candidates only will move forward to the next stage of IBPS PO. Final of shortlisted candidates will be based on Mains and Interview scores. 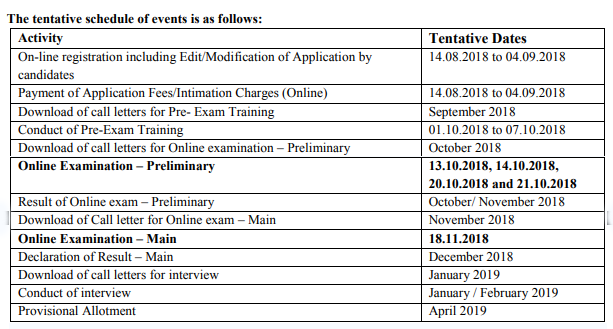 Here you can find the important events of IBPS PO exam date, Online registration Starting/Ending Date, Online Payment dates and more. This list is more important to follow and track the current updates of IBPS PO 2018. IBPS PO 2018 notification released with 4102 vacancies. There are 20 Lakh candidates are appearing for IBPS PO examination. So the exam will be tougher. Start your preparation according to current IBPS PO Vacancy. IBPS PO Vacancy Break up available category wise. Check the vacancy chart according to your category and apply for IBPS PO 2018 Recruitment. IBPS PO exam notification released will be an online based exam and conducting across the nation. There are numerous centers according to the candidate’s preference will be allotted to the aspirants. The selection of the candidate for IBPS PO/MT vacancy will be based on Common Written Examination (CWE). There is the level of selection process takes to clear IBPS PO. That is preliminary, mains and interview. The aspirant should qualify each phase to enroll as IBPS PO 2018. Here you can find the detailed information of the IBPS PO Selection process. Based on the cut off mark and requirement the candidates will be shortlisted on Prelims examination. The exam will be online based. Only the applicant who qualifies on IBPS Prelims will be selected to appear on Mains Examination. Candidates clear sectional as well as an overall cut-off for IBPS PO examination. A score of mains will be considered in the final selection of IBPS PO. The main exam will be tougher than prelims only the qualified candidates are eligible to appear for an interview. IBPS PO final level of selection will be based on Mains and interview scores. To qualify on each section will be must to enroll for IBPS PO examination. The notification of IBPS PO contains various information such as exam pattern, syllabus, exam date, marks distribution and more. Read the notification carefully to get aware of the entire process of IBPS PO Exam. Time management is more essential for all exams. Start your preparation familiar with the syllabus and nature of question papers asked before. A candidate must appear for Prelims exam first and selected candidates will appear for Mains Exam. The score of Preliminary Exam will not be taken into consideration for final allotment. Final selection will be based on the Mains Exam and Interview Process. The preliminary examination of IBPS PO 2018 will be consists of 100 Mark with 3 subjects included that are Quantitative Aptitude, Reasoning Ability, and English Language. It will be an objective type and time duration will be 1 hour. Here in the below tabular column, you can find the detailed information of New Exam Pattern. There is negative marking in IBPS PO pre-exam and 0.25 marks are deducted for each wrong answer. In IBPS PO Mains has 5 sections (4+1), it means 4 sections in objective type and one is descriptive type examination. The candidates should qualify the prelims and mains examination to move forward to clear Interview process. Descriptive Test for 25 marks. After the successful completion of mains examination, qualified candidates will be called to face an interview in person. Interview holding 100 Marks and the candidates should score 40% of marks to qualify. One of the most notable things is the eligibility criteria. IBPS PO announced certain eligibility norms for applicants who wish to apply for Probationary Officers posts. The candidates satisfying eligibility criteria can apply for IBPS PO post. Educational Qualification: The candidate should have any graduation degree in any discipline from a University recognized by the Govt. Of India or any equivalent qualification recognized as such by the Central Government to apply for IBPS PO examination with working knowledge of computer system is necessary. Note: The candidate must possess valid Mark-sheet / Degree Certificate while registering online. Language Proficiency: Verbal and written proficiency in the official language of the State/UT is desirable. The candidate must be able to read, write and speak the language. The applicant age between of 20 to 30 years will be considered as eligible to apply for IBPS PO exam.